The European Ramblers' Association (ERA) created 12 long distance paths, simply called E1 to E12, that span through Europe. Some of those are partly missing or badly marked. The European long distance path E1 is one of the more favorable and better marked paths. Since summer 2013, there is be a continous connection from the North Cape in Norway to Scapoli in Central Italy. The E1 path starts in Norway at the North Cape and leads in first instance to Kautokeino. Here the Nordkalottruta takes over, passing Finland and Sweden, and leads to Sulitjelma on its southern end. From the border triangle between Norway, Sweden and Finland on, the path is also used by the Grensesømmen trail. Together with the Nordlandsruta, the E1 path goes on to Harvasstua north of the Børgefjell National Park. Still upon the Grensesømmen, the E1 crosses the Norwegian-Swedish border several times until between Svukuriset in Norway and Grövelsjön in Sweden, the E1 finally leaves Norway to co0ntinue in Sweden. From the North Cape to Grövelsjön, the E1 path has a length of more than 2,000 kilometres (1,250 miles). From Grövelsjön on, many different regional hiking trails take the E1 further to Varberg at the Kattegat. Those are: the Southern Kungsleden until Sälen, Vasaloppsleden until Mora, Siljansleden until Leksand, local paths in Gagnef until Gyllbergen, Sméleden until Björsjö, Malingsbo-Klotenrundan until Kloten, Bergslagsleden until Stenkällegården (near Karlsborg), Västra Vätterleden until Mullsjö, Redvägsleden and Åsundenleden until Ulricehamn, Sjuhäradsleden until Borås, Knalleleden until Hindås, Vildmarksleden until Skatås, Bohusleden until Blåvättnerna and finally Hallandsleden until Varberg. By ferry, the Danish city of Grenå is reached where the Molsruten continues to lead the E1 path to Aarhus. The hiking paths Aarhus-Silkeborg and Silkeborg-Horsens are followed until in Vrads Sande, the E1 arrives at the Hærvejen which southern end lies in Padborg near the German border. By the Gendarmstien, the connection to the E1 in Germany is made in Kruså / Kupfermühle. Other than in the Scandinavian countries, the European Long Distance Path E1 is a trail on its own in Germany. Only a few other, older hiking trails are used by it. Via Flensburg, Schleswig, Kiel, Lübeck, Hamburg, Soltau and Celle, the E1 comes to the mountains of Deister, Süntel and Eggegebirge. The course follows via Willingen, Siegen, through the Westerwald and Taunus to Frankfurt am Main. South of the city, the path continues via Darmstadt and Heidelberg to Pforzheim where it starts to cross the Black Forest. 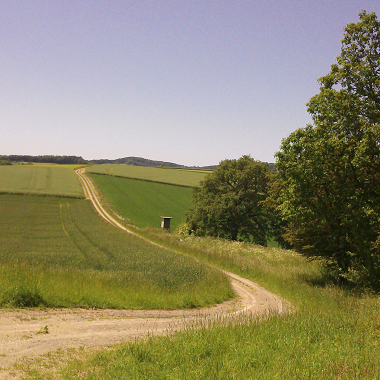 Via Singen and Konstanz, the path leads into Switzerland. In Switzerland again, local paths lead the E1 to Lake Lucerne, over the Gotthard pass to Morcote by the Lake Lugano. On the opposite side of the lake, in Porto Ceresio, the Italian part of the E1 begins. The path leads at first through the Ticino valley to the Po valley and then upwards into the Apennines. Near Genoa, the E1 path hits the Alta Via dei Monti Liguri which it follows until the ski resort of Zum Zeri-Passo dei due Santi. There it is taken over by the Grande Escursione Appenninica (GEA). From the southern end of the GEA at the village of Castelluccio di Norcia, the long distance hiking path continues to Scapoli in the province of Isernia where it ends by now. Some parts further south are already finalized (for instance in the Cilento National Park) but not connected to the main trail. The planned end of the E1 path is Capo Passero, the most southern point of Sicily.